Two of Norwegian Cruise Line's Twitter followers may have found a "Hidden Cruise" this week and be sailing for free, but Norwegian Cruise Line found something even better - a way to access a gold mine through Twitter. The Costa Concordia convoy is inching ever closer to Genoa, but they are now manipulating things so that they will avoid some bad weather and arrive at the scheduled time. Wednesday afternoon, the Senate Commerce Committee held a hearing on a bill sponsored by Sen John Rockefeller. It is another in his ongoing series of attempts to provide more protection (both financial and safety) for US consumers and further regulate the cruise industry. 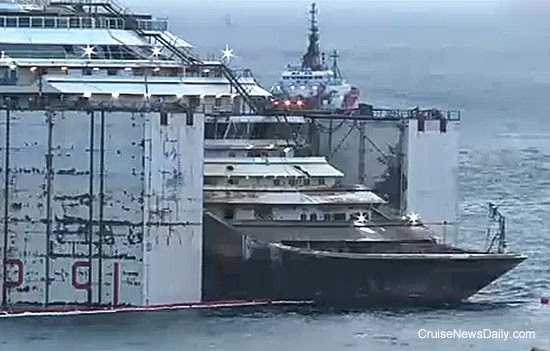 Costa Concordia’s convoy is moving right along toward Genoa, and there have been no problems. At 6:30pm CET, Concordia had traveled 63 nautical miles after traveling 30 hours at an average speed of 2 knots. 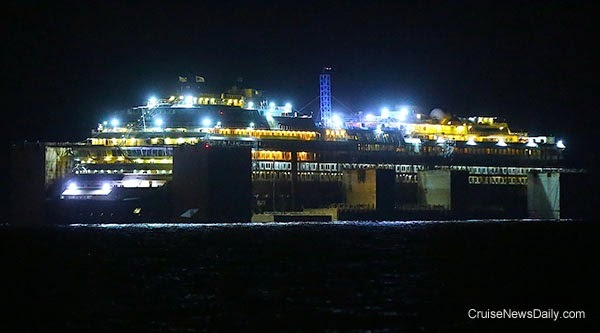 Photos of Costa Concordia and its convoy navigating to Genoa. Photos courtesy of Edmondo Zanini. Video courtesy of youreporter.it. All rights reserved. May not be copied or used without permission. Carnival has learned something about the Galveston market. They love variety - and longer cruises. In April the line announced some 10- and 11-day cruises one way between the Texas city and San Juan via ports in the Caribbean that are too far east to ever be called on during a regular 7-day itinerary. Even though those sailings aren’t until the fall of 2015 and the winter of 2016, the line received such a strong response, they’ve scheduled three more earlier sailings in February and March 2015. Just to add to the variety in Galveston, Carnival has scheduled the huge Carnival Magic on short cruises for the first time while Carnival Triumph is away on the longer cruises in early 2015. 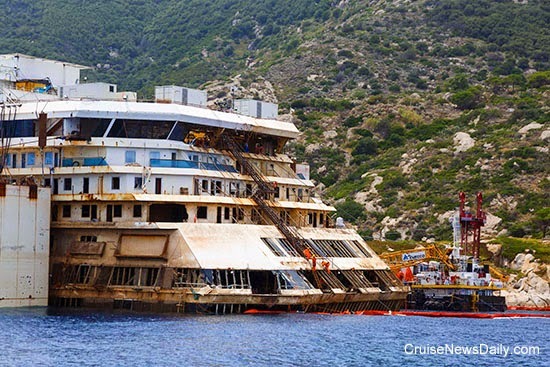 Operations to prepare for Costa Concordia’s departure from Giglio Island began early this morning at about 6am (local time), and as soon as the ferry arrived from the mainland (at 8:30), they closed the harbor and began disconnecting the cables that moored the ship. 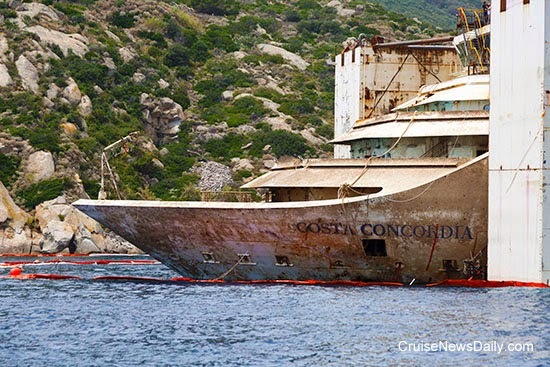 About 11:00am, earlier that expected, everything went so smoothly, the convoy was sailing away from the island, two and a half years after Costa Concordia had arrived so unexpectedly. CND subscribers also read about Italian babies and their counterparts elsewhere ... and an arrivederci to Israel. 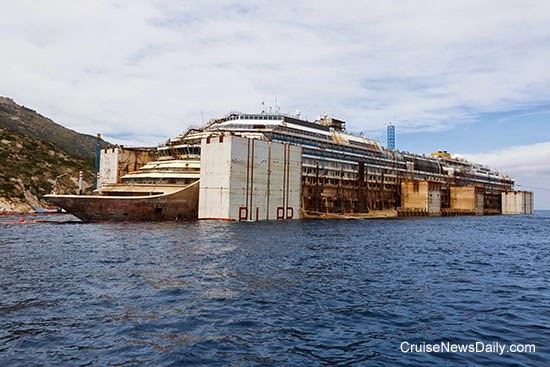 As of about noon today (local time on Giglio) Titan Micoperi declared the refloating of Costa Concordia complete. The rest of the day was spent making final preparations for departure for Genoa on Wednesday. Wednesday’s departure procedures will begin after the ferry arrives at 8:30am, since the operation will involve closing the harbor for approximately four hours. 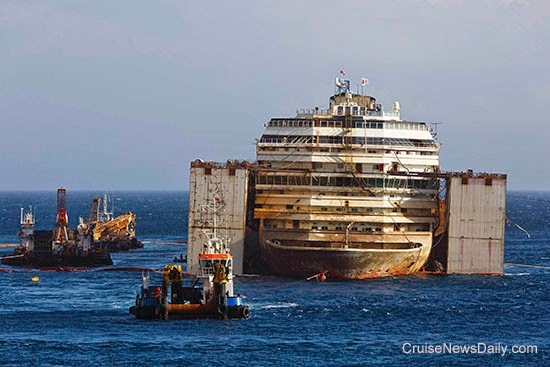 At about noon today (local time on Giglio), Titan Micoperi declared the refloat of Costa Concordia completed. Towing to Genoa for breaking of the ship will begin on Wednesday morning. The operation will begin at approximately 8:30am, and actual departure of the convoy of 14 vessels is expected to begin about four hours later. could drain from the emerged decks. Reserved times are just one of the changes coming to the main dining rooms aboard most Norwegian Cruise Line ships. But then again, it’s still Freestyle, so you only need to make a reservation if you want one. But there’s even a bigger change. The menus have undergone a complete change in content and style. It’s part of Norwegian’s NEXT program which is focused on bringing new enhancements, experiences and transformations across the fleet. 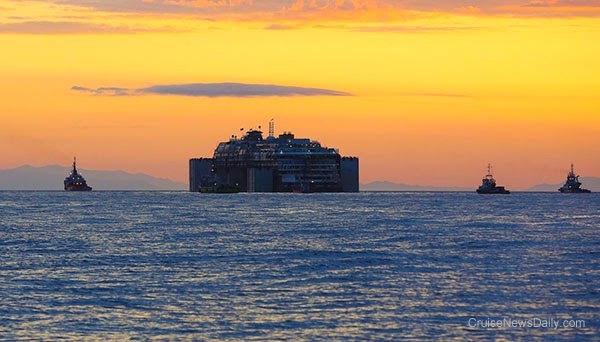 If all had gone according to the original plan, tonight (US time), Costa Concordia would be on its way to Genoa. 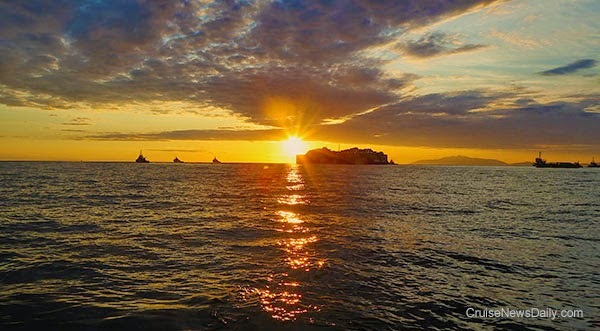 Instead, as the sun is rising over Giglio Harbor Tuesday morning, the ship is still sitting where it has been, but it has now been raised almost to the draft at which it will be towed. The departure from Giglio is now set for Wednesday. 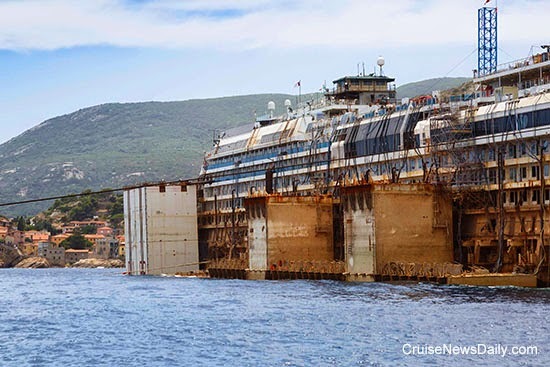 All weekend, Costa Concordia has been slowly rising out of the water. By dawn Monday morning it was apparent the ship had risen dramatically in the last 24 hours. Eleven meters have emerged with three more to go before it reaches the required draft to tow to Genoa. The operations center reports that sponson S4 has now been lowered almost fully. Work is in progress to lower S5 and S14. Departure from Giglio is now planned for Wednesday, July 23. All rights reserved. May not be copied or used without permission. Overnight the Oil Response Team was called upon to investigate and clean a pool of hydrocarbons seen floating toward the aft end of the midship area of Costa Concordia. It was cleaned by deploying absorbent booms. Once the pool was absorbed, the absorbent booms were replaced, but no more of the substance has been spotted. The salvage operations center says no damage was found to the structure or the hot tap flanges. The hot tap flanges were drilled into the fuel tanks during the initial phase of the salvage to facilitate the draining of the fuel. Apparently the source of the hydrocarbons has not yet been determined. 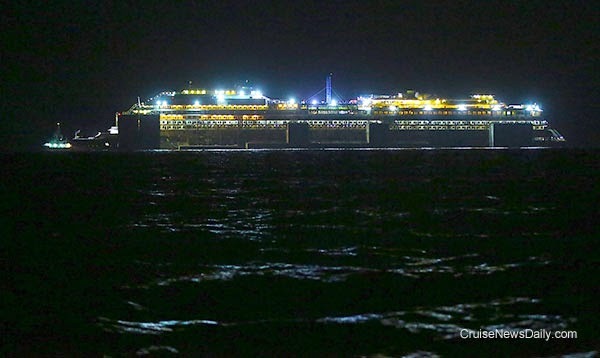 The operations center reports that as of midnight local time, about 6.5 meters of the ship has emerged from underwater. There are still six starboard sponsons to be lowered into their final positions which will raise the ship further. The operations center says that once they are fully lowered, Decks 4 and 3 will emerge rapidly.